Wuala is a online storage solution developed in Switzerland. The service is based on 4 main features: backup files on the Wuala servers, sync files across multiple devices, share things with your friends and secure your content by encrypting it before transmitting it over the Internet. The company advertises itself as being one of the most secure alternatives in the cloud storage industry due to its full client-side encryption process. It provides a client utility for several platforms, including Windows, Mac, Linux and Mobile. In each of the last 12 months Wuala managed consistently to attract tens of thousands of visitors to its website. Wuala offers several pricing plans. The free edition includes 2 GB of free storage, while paid plans start at 10 GB of storage for 19 EUR per year. The service started as a research project at the Swiss Federal Institute of Technology in Zurich. It got incorporated as a private company under the name Caleido AG, but in March 2009 the site got acquired by LaCie, a French-based company, to complement its existent external hard drive business. 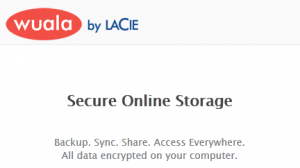 Today Wuala offers sign-up discounts for LaCie customers, such as 10 GB for one year upon the acquisition of a LaCie external hard drive, or 4 GB for two years for a LaCie USB flash drive. 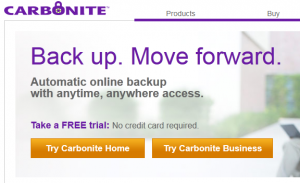 Carbonite provides an automatic online backup service with anytime, anywhere access. By installing the Carbonite utility (Windows or Mac required) the hard-disk files will be automatically backed up in the background on the Carbonite servers by using the computer’s Internet connection. When a file gets deleted, Carbonite keeps a backup for 30 days to allow users to recover it in case of accidental deletions. Older versions of modified files are kept for 90 days for similar reasons. The backups are available online on Carbonite.com or directly from the desktop. The restore process is the easiest in the industry (the company focused on it as it believes that the only reason to back up files is to be able to get them back quickly when needed). Plans start at $59 per computer per year with the first 15 days offered as a free trial. There are two plan types available: the home plan, which has no size limitations, and the small business plan which offers a backup space of 250 GB by default. The minimum price level translates to $5 per month, a value proposition that most users will find decently priced for having their valuable files properly backed up. In August 2011, Carbonite had its Initial Public Offering on the US market. The deal almost never happened due to poor market conditions but it was saved in the final hours according to MarketWatch. Carbonite has yet to turn a profit, despite rising revenues, as it invests aggressively in acquiring new customers. In 2010 it spent $24 million on advertising – as much as $55 per customer acquisition, an amount justified considering that their customers stick with them – on average – for 5 years and the minimum plan is $59 per year. It’s difficult to predict when they’ll start to make a profit, but if they continue to keep their customers, on average, for 5 years, then it’s just a matter of time until they recover the initial customer acquisition costs. You can see more Carbonite commercials on their YouTube channel.